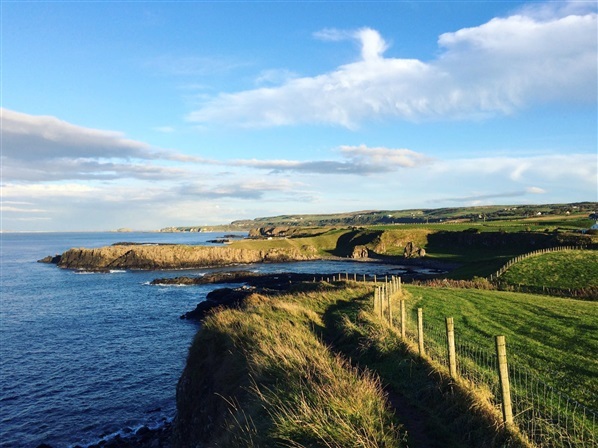 Away a Wee Walk share with us some secrets about the epic Causeway Coast and why everyone should walk it! The Victorians were onto something. Long before the modern visitor facilities at the Causeway, much of the site was more challenging to access. It wasn't uncommon to visit the stones by boat on a tour and many people walked much more of the coastline along a magnificent lower path (now closed due to erosion) and back along the cliff tops. With easier access the cliff top walking route has become somewhat of a secret and is underused. Imagine if more of the 850,000 visitors who go to the Causeway each year were aware that just one hour away on foot, along the cliffs, is a view that rivals the Cliffs of Moher. The site with the best view is known as Hamilton’s' Seat. 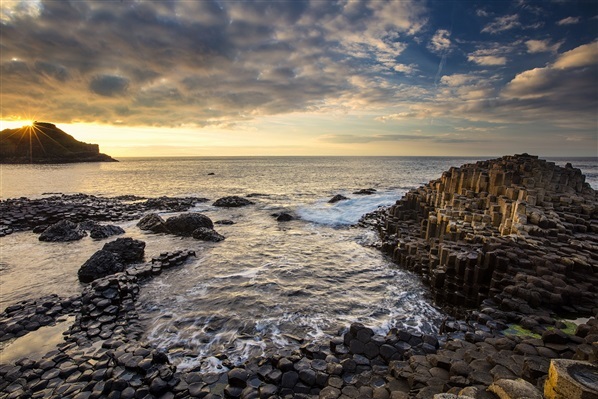 We think that the Causeway is all about the honeycombed shaped 'stones', (which are technically rocks) however the stones are not the exclusive reason the location is a UNESCO World Heritage Site. Another reason is the geological story, of when America effectively, went to America - the beginning of the separating of Europe and North America and the creation of the North Atlantic Ocean. It all happened around 60 million years ago when the rocks cooled very slowly (not very rapidly, as many mistakenly believe). The area was a huge river valley which acted like a thermos flask causing the lava to cool very slowly. As the lava cooled and contracted it caused the hexagonal columns to form at the main site and along the coast. Bothy's can be found around the Scottish and Irish coast and in remote mountain locations. They range in size and shape but traditionally were very simple shelter for fishermen and mountain users. There is a renovated bothy at Port Moon, near Dunseverick, which can now be booked by sea kayakers paddling the North Coast Sea Kayak Trail. Just keep swimming. Dunseverick must be one of the smallest places in Ireland that neither has a pub nor a post office yet it has two lay-bys, a small castle ruin, a harbour and rock pools! The pools are viewable from the road down to the harbour and are regularly used by locals in the know for swimming in ocean water without having to deal with tides and waves. If you clamour over a few more rocks, you'll discover smaller but deeper pools, out of view from the harbour road. The castle ruin at Dunseverick might be a disappointment to anyone showing up to see an actual castle. We know very little about Dunseverick today, yet archaeologists are able to inform us that one of the five roads that left Tara, site of the ancient Seat of Ireland's High Kings, ended at this location on the Causeway Coast and proves that the location was once highly strategic in Ireland's past. 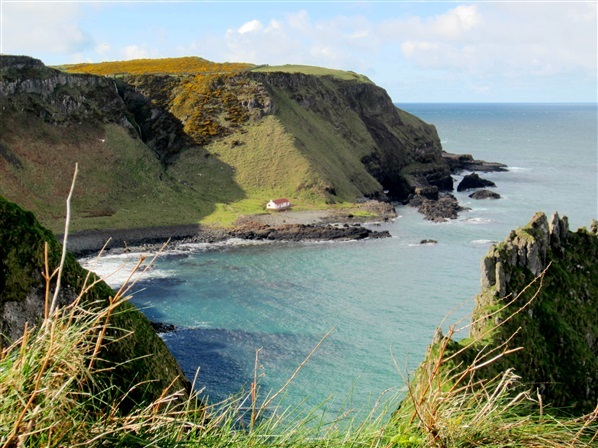 The Causeway Coast Way, especially the section from Portballintrae to Carrick-A-Rede Rope Bridge is among the most scenic coastal walks you can find anywhere. Check out tide times if you want to access White Park Bay the easy way. You roughly have three hours either side of low tide if you want to keep your feet dry! 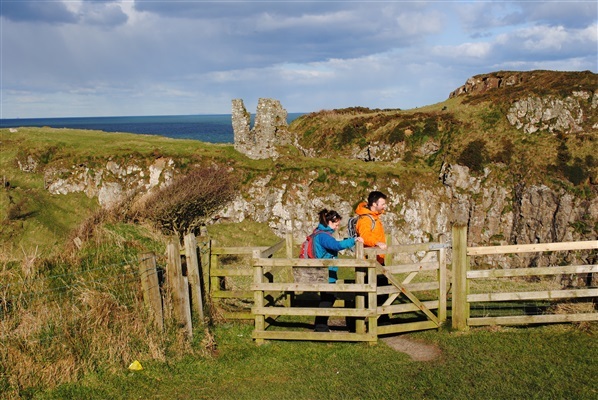 Away A Wee Walk regularly offer guided 6 mile walking tours along one of the most scenic sections of the Causeway Coast Way from Dunseverick to the Giant’s Causeway. Take in amazing cliff top views whilst hearing plenty of interesting facts from a passionate guide. Cost: £35pp for a half day guided tour. A lifelong lover of the outdoors, Eimear set up 'Away A Wee Walk' (Northern Ireland's only dedicated scenic hiking tours and holiday company) after a 500 mile trek in Spain. 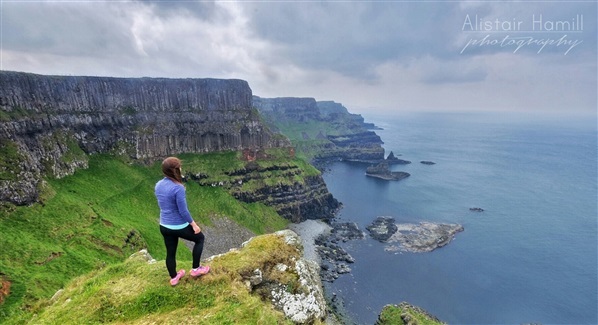 She now provides hikes and holidays that are the 'quintessence of Ireland', creating experiences that are cherished forever. Eimear often finds herself pointing out breath taking landscapes to her visitors, while they take photographs of the sheep! Whether you live for frights or you’re a bit of a scaredy cat, there are spooky (and not so spooky) Halloween adventures for those brave enough to leave their houses this October. To help you out we have pulled together our list of top Halloween events happening across Northern Ireland this year. Northern Ireland's Scariest Halloween Event! An action packed night sure to freak out the toughest of horror fanatics! The original “Woodland Trail” returns with an entirely new route and even more horrible creatures, sure to satisfy the Fright Night devotees and the newbies looking for a good scare. Are you brave enough to meet the inbred creatures who promise to freak out the toughest of horror fanatics! Or visit the circus who has turned to the darkside. Check out OutdoorNI's Blog "OutdoorNI Does...The JungleNI's Fright Night" to find out more about the scare zones mentioned above as well as the murderous maze, zombie paintabll and more. Get ready to celebrate the half term holidays as a family taking part in a range of activities including climbing, zip lining, archery and canoeing. After an action packed day spend the evening around the campfire carving pumpkins before spending the night if you dare in a camping pod. A special Halloween high speed voyage around Strangford Lough with some special Halloween treats for the kids! With lots of suprises along the way and spooky stories this is one half term adventure not to be missed. Have a half-term blast doing a range of activities with a spooky Halloween twist! There will be lots of activities to choose from including archery, giant catapults, night-line and splatmaster paintball. Finish your day off toasting marshamallows and drinking hot chocolate around the fire. Keep Your Wee Monsters Entertained While You're At Work! An action packed multi activity scheme during the half term holidays for children aged between 8 and 12 years old. A lot of fun is guaranteed with activities including caving, climbing, archery and so much more. Drop your kids off on your way into work for a fun few days water zorbing, kayaking, learning circus skills and more on the banks of the River Lagan. An early drop off service is also available. Don't forget to tell us about your adventures on Facebook & Twitter.